Discussion of article "Developing stock indicators featuring volume control through the example of the delta indicator"
The article deals with the algorithm of developing stock indicators based on real volumes using the CopyTicks() and CopyTicksRange() functions. Some subtle aspects of developing such indicators, as well as their operation in real time and in the strategy tester are also described. In the terminal, the real volume is indicated simply as Volume. It will be of interest to us. Since the terminal features tick history, as well as time and sales, it is now possible to develop stock indicators. They allow us to see what is happening "behind the scenes", i.e. what the real volume consists of: volume and frequency of executed trades, as well as the correlation of sellers and buyers at a certain time period. This means we can now expand the volume into components. These data can significantly improve the accuracy of our trading forecasts. At the same time, it is more difficult to develop such an indicator as compared to a usual one. This article thoroughly describes the sequence and subtleties of developing stock indicators, features of their work and testing. As an example, we will develop the delta (difference) indicator of buy and sell volumes that form the real volume. As the indicator is developed, the rules of working with the tick flow are to be described as well. The final result is presented below. A blue bar shows the dominance of buyers on a certain candle, while a red one — the dominance of sellers. The estimation of real volumes opens up new horizons for the stock market analysis allowing for better understanding of the price movement. 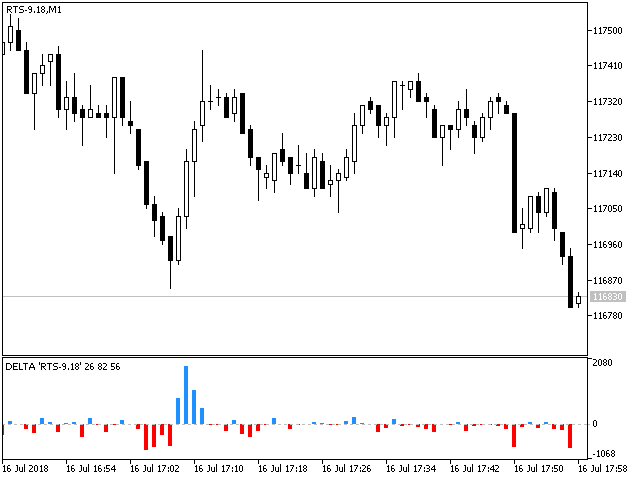 This indicator is only a small part of what can be developed based on the tick data analysis. Creating stock indicators based on real volumes is quite a feasible task. I hope, this article will help you in creating such indicators and improving your trade. congratulations for great job ! this is best Delta indicator until now, very fast. I try modify it to plot only positive values with diferent color to buy/sell delta (best to compare size of histogram bars),without success, You can give some tipe how to do it or post where should modify the original code ? Another question, is it possible to plot a vertical instead horizontal histogram ? I try to plot vertical histogram using https://www.mql5.com/en/articles/2714 but it didn´t plot any value, in fact I try plot volume values in vertical histogram and it didn´t plot any king of volume (I use NormalizeDouble to convert from long to double). Another question, is it possible to plot a vertical instead horizontal histogram ? It's not possible in this indicator. First of alll, congratulations!!! Great, great, great job!!! That's what i'm looking for. However, this indicator is half of my desire. I'd like to draw a bolinger band over delta indicator to show me where the money flow is greater than a normal behavior. I had tried this, but i wasn't able to see the bbands lines at the same window. Could you help me? Sorry, but I don't work with BB. You can use Freelance for your task.